1993 - The Trial（英语：The Trial (1993 film)） Josef K.
1990 周六夜现场 Saturday Night Live 他自己（主持） 集数："凯尔·麦克拉兰/西尼德·奥康娜"
1990 - American Experience（英语：American Experience） 旁白 集数："Insanity on Trial"
1991 魔界奇谭 Tales from the Crypt Earl Raymond Digs 集数："Carrion Death"
2004 法律与秩序：特殊受害者 Law & Order: Special Victims Unit Dr. Brett Morton 集数："Conscience"
2011 法律与秩序：特殊受害者 Law & Order: Special Victims Unit Andrew Raines 集数："Blood Brothers"
集数："Weirdmageddon 3: Take Back The Falls（英语：Weirdmageddon 3: Take Back The Falls）"
^ De Vries, Hilary. 'Diane, Let Me Tell You About Kyle MacLachlan' : 'Twin Peaks' is a nice place to visit, but he probably wouldn't want to live there. Los Angeles Times. 1990-09-23. ^ "This much I know: Kyle MacLachlan, actor, 49, London". The Observer. April 6, 2008. 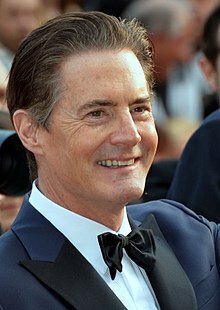 ^ Kyle MacLachlan's New Show. Showbiz Tonighthttp://transcripts.cnn.com/TRANSCRIPTS/0601/20/sbt.01.html |transcripturl=缺少标题 (帮助). 2006-01-20. CNN.